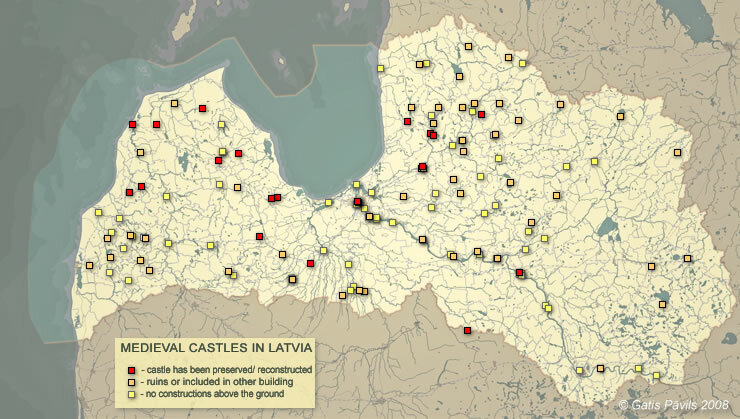 In the map below there have been included locations of all known medieval castles of Latvia. Several castles are located close to each other - in this map they overlap and can not be visually separated. In total there is included information about 134 castles. Red squares show the castles which are more or less well preserved - there have been preserved outer walls and roof. Part of these buildings is in active use (Riga castle), part is not used and thus extremely endangered (buildings of Bramberge estate). In total map contains 19 such castles. Yellow squares with black outine show locations of ruins of medieval castles. In this category there are included those buildings which have been significantly damaged but there are initial construction still rising above the ground. Here are included also the buildings which have been incorporated as a smaller part of contemporary buildings, f.e. Svitene castle. In total in map there are 52 such castle ruins in the map. Light yellow with pale outline show locations of castles which don't have visible remnants above the ground. Sometimes in nature there can be seen earthen ramparts and ruins covered with soil. Often even such marks are not seen. Sometimes the conquerors in hillforts of local Livs or Balts built wooden fortified castles without significant changes to former system of earthen fortifications. Sometimes sites of such castles have not been localised - but is all the options for location of castle are close to each other, castle is shown in this map because the symbol covers all options for location. In total there are 65 such sites shown. Several medeval castles have been mentioned in written sources but the location of such castles is not known even approximately. Map, f.e. does not contain Live, Remine, Lubana castles. Map has been compiled basing on the data from "Latvijas 12. gadsimta beigu - 17. gadsimta vācu piļu leksikons" ("Lexicon of German castles in Latvia, end of 12th century - 17th century"), additionally to castles mentioned in this source there has been included also the old manor-house in Dunalka, which has been constructed at the end of 16th century (3) and Sigulda Hill of the Cross castle - site which has been recognised as a castle in excavations from 2007 (2). While examining this map it should be remembered that medieval times lasted for several centuries, there lived many generations of people in these times. All castles seen on this map dod not exist simultaneously - often there were no remnants of the first castle when nearby there was started a new medieval castle. 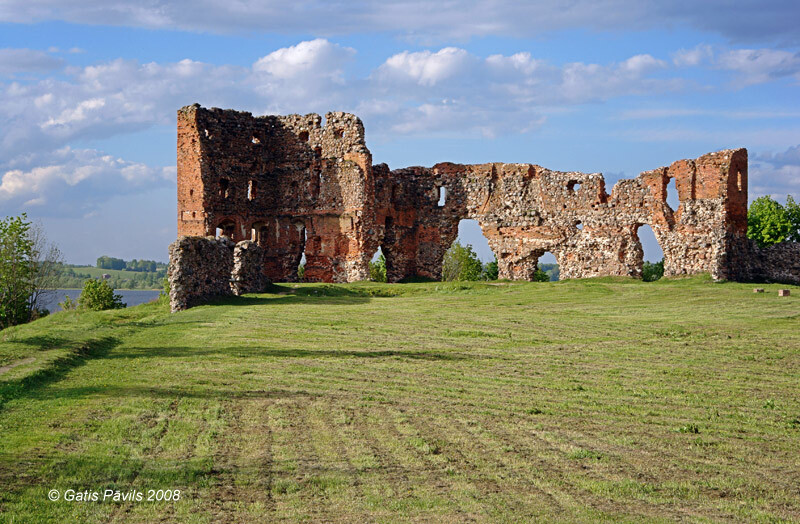 Ludza castle (14th century) has been bult to protect the eastern border of Livonia. There were implemented certain political goals of certain influential circles while building each of the medieval castle - thus the setting of each castle is not accidental. In a case of Latvia only few castles have been located on borders of the recently conquered land - thus, f.e. Vilaka, Aluksne, Ludza castles protected against potential invasions from the east. In 13th-14th centuries it was not that pressing to create a stronger line of fortifications on the eastern border - this can be partly explained by the invasion of Mongol invaders in lands of Russians. Several fortified castles have been located also closer to the border of Lithuanian-Polish state. Much higher attention was paid to protection of trade routes. Especially clearly visible is the string of medieval castles along the River Daugava - Daugava was one of the most important medieval inland waterways of Northern Europe, which connected Northern Europe with Russian lands. Second most important watercourse was Gauja River - it served as important section on the way from Western Europe to Pskov and Novgorod. Several castles have been built as support fortifications on land routes - here stands out a group of castles on the way from Prussia to Riga, consisting of Klaipeda (in contemporary Lithuania), Grobina, Durbe, Aizpute, Kuldiga, Kandava, Tukums. Often castles were built as a temporary support post on a border of recently conquered land, until conquerors managed to take control of further land and support post lost its military significance. In a such way there were created several short-lived wooden castles, f.e. in Semigallia. Major part of castles were built as a support posts in central part of conquered land. Initially such castles helped to invaders to retain their influence in fights with indigenous people but before long there started military conflicts among the invaders themselves. During the fighting between Archbishopric of Riga and Livonian Order castles were besieged, captured and ravaged. Many medieval castles achieved long-term influence, there appeared cities and towns around them. In a such way there appeared Riga, Jelgava, Rezekne, Daugavpils, Ventspils, Kuldiga and many other towns. In the map it can be seen that higher density of castles there is in southwestern part of Kurzeme and central-northern part of Vidzeme. Meanwhile in Augszeme the only castle away from the banks of the Daugava river is Nereta castle, which is built at the end of medieval period. Very few castles are located in Latgale. There are few castles near the sea except for the castles guarding the mouth of rivers important for trade (Saka, Ventspils, Daugavgriva, Salacgriva). There are somewhat more castles in good shape in Kurzeme - here are located several of the best preserved castles of Latvia (Dundaga, Jaunpils, Slokenbeka, Ventspils, Edole, Alsunga). Meanwhile east from Riga there have been destroyed almost all castles - out of larger castles only Lielstraupe, Mazstraupe and Krustpils castles have been preserved. Enciklopēdija Latvijas pagasti. 1. sējums, 230. lpp. Rīga, 2001.